Nasir Ali trumpets are ideal for beginner to medium level or student musicians. This pocket trumpet features a phosphorus copper lead mouth pipe, with 3 smooth action valves. Every pocket trumpet is play tested at our factory and re-tested by a professional to ensure that their high-quality standards are met. 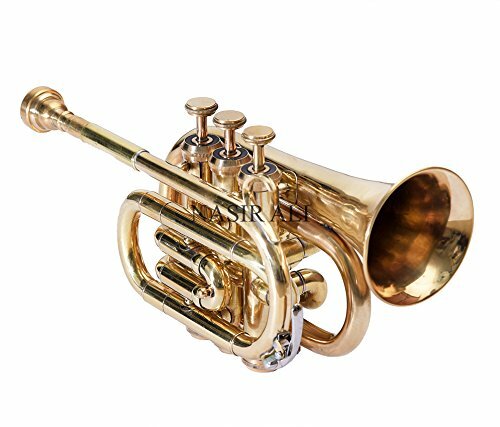 This is why thousands of instructors have approved these trumpets. This pocket trumpet package includes a hard shell case, a pair of gloves, a soft cleaning cloth, and a bottle of valve oil. Buy with confidence as it comes with a 30 days warranty against any manufacturer"s defects. Includes a carrying case and a mouthpiece.